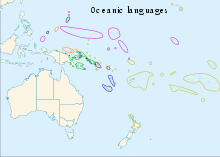 Yapese is a language spoken by the people on the island of Yap (Federated States of Micronesia). It belongs to the Austronesian languages, more specifically to the Oceanic branch of that family. It has been difficult to classify it further, but Yapese may prove to be one of the Admiralty Islands languages. The branches of the Oceanic languages. Orange is the Admiralties languages and Yapese, yellow-orange is St. Matthias, green is Western Oceanic, violet is Temotu, and the rest are Central-Eastern: dark red Southeast Solomons, blue Southern Oceanic, pink Micronesian, and ocher Central Pacific linkage. Written Yapese uses Latin script. In Yapese spelling as practiced until the 1970s, the glottal stop was not written with an explicit character. A word-final glottal stop was represented by doubling the final vowel letter. Glottalization of consonants was represented with an apostrophe. In the 1970s an orthography was created which uses double vowel letters to represent long vowels; and because of the ambiguity that would occur if the glottal stop was not written, the glottal stop was written with the letter q. This new orthography using the letter q is not in universal use, but many works and maps about Yap represent place names using the orthography and contain amounts of the letter q that are likely to be puzzling to persons not familiar with the language and the new orthography. Apart from a couple grammatical forms which are V, syllables are CV or CVC. In the table below, each phoneme is listed to the left of the grapheme that represents it in Yapese orthography. /h/ <h> and /j/ <j> only occur in English and Japanese loans (/j/ <y> does occur in native words, however). ^ "Yapese". Ethnologue. 2018. Retrieved 2018-08-11. ^ Hammarström, Harald; Forkel, Robert; Haspelmath, Martin, eds. (2017). "Yapese". Glottolog 3.0. Jena, Germany: Max Planck Institute for the Science of Human History. ^ Lynch, John; Malcolm Ross; Terry Crowley (2002). The Oceanic languages. Richmond, Surrey: Curzon. ISBN 978-0-7007-1128-4. OCLC 48929366. ^ Ladefoged, Peter; Maddieson, Ian (1996). The Sounds of the World's Languages. Oxford: Blackwell. p. 178. ISBN 0-631-19814-8. ^ a b c Jensen, John Thayer (1977). Yapese Reference Grammar. Honolulu: University of Hawai‘i Press. ISBN 978-0-8248-0476-3. OCLC 929721939. Jensen, John Thayer. 1977. Yapese–English Dictionary. (PALI Language Texts: Micronesia.) Honolulu: University of Hawai‘i Press.